Ilan Stavans was born in Mexico in 1961 to an Eastern European Jewish family. In 1985, after a sojourn in Spain, he moved to the United States and began writing while taking a doctorate from Columbia University. The past decade has established him as a distinguished Latino critic, editor and author. 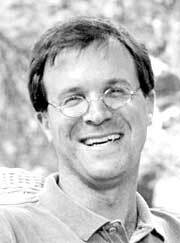 Currently he is a professor of Latin American and Latino Cultures at Amherst College. His published work, translated into several languages, includes The Hispanic Condition; On Borrowed Words: A Memoir of Language; The Essential Ilan Stavans; and The One-Handed Pianist and Other Stories. He is the editor of The Oxford Book of Jewish Stories and The Oxford Book of Latin American Essays. Stavans has been a National Book Critics Circle Award nominee and the recipient of the Latino Literature Prize and a Guggenheim Fellowship, among other honors. 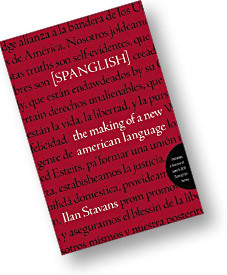 2003 saw the publication of the controversial Spanglish: The Making of a New American Language, a pan-Hispanic socio-linguistic reference work which includes a vibrant introductory essay examining the historical context of Spanglish, a lexicon of 4,500 words, and Stavans Spanglish translation of the first chapter of Don Quijote de La Mancha. The following interview was conducted by TBRs Spanish editor and a colleague, who have devoted their current issue to the topic of Spanglish. Most of the interview, therefore, was conducted in Spanish. Madeline Beach Carey provides an English translation. TBR: You have studied the subject of Hispanic culture north and south of the Rio Grande. The Oxford Book of Latin American Essays examines Andrés Bello´s Iberian America intellectual tradition while The Hispanic Condition is a reflection on Latino identity in the United States. In other works, such as The Essential Ilan Stavans and On Borrowed Words, you explore another important area within that context: your Jewish heritage. How did Spanglish develop as a topic of interest? IS: Spanglish isnt a beginning for me, but rather a consummation. I began to think about it seriously in the mid 90s. My first impression was that it was similar to Yiddish. I lived in London with a Guggenheim grant at the end of that decade. I was completely devoted to the autobiography, in which I set out to explain my personal journey from the verbal perspective: the languages of my childhood and adolescence were Yiddish and Spanish, then came Hebrew, and finally English appeared in 1985 when I left my native Mexico and moved to New York. Strangely, as the manuscript of On Borrowed Words moved forward, I felt more drawn to Spanglish. At the time I didnt understand why, but now I do. The autobiography shows how languages compartmentalize our lives. Yiddish and Spanish were never mixed in my childhood. My parents as well as my teachers did what they could to keep these languages separate. Why so much effort? How to explain our rejection of mixed languages? Where does the attitude we have toward mixtures like Frangalis, Spanglish or Portuñol, which are often described as mere linguistic "corruptions," come from? It was when I returned to the United States from London that I decided to analyze the phenomenon of Spanglish. Doing so opened up my intellectual horizon. I realized that XIII-century Spanish, for example, was a type similar to todays Spanglish. I was also drawn to dictionaries: what function do they serve socially? Who makes them and who consumes them? What history do they have in different cultures? For example, whats behind Doctor Johnsons dictionary or that of Noah Webster, who certainly plagiarized more than he should have from direct ancestors. TBR: What is the current state of Spanglish in the United States? IS: Its diversification is astonishing: from lowly-regarded jerga callejero (street jargon) in the last decade it has become a decisive cultural phenomenon. The national variants are starting to come together in a media Spanglish that points to a sort of verbal standardization. There are TV programs that use Spanglish, advertisements, radio stations, womens magazines . . .Corporations dont ignore its commercial value. Hallmark Cards, for example, recently launched a line of cards in Spanglish targeted at consumers between ages 10 and 30. TBR: What influence does Spanglish have on new trends, in literature or music, for example? IS: There is a literary current, which goes back at least to the 1970s, whose mode of communication is Spanglish. This trend has diversified in the last few years. It is no longer just used by New York or Chicano poets but by a much wider and more heterogeneous group of essayists, short story writers and novelists. Spanglish has also marked the so-called "new Latino cooking," which is a fusion of diverse extractions and flavors. The names and ingredients of the dishes launched in restaurants in Miami and Los Angeles and recipes promoted in magazines are in Spanglish. In addition, fashion displays similar strategies. We´re in a moment of "pan-latinonization," an era in which Hispanic identity is no longer represented as a series of diverging national heritages but as an agglomeration of the parts. Media Spanglish is, obviously, the perfect example of this agglomeration. The time will come, maybe ten years from now, when the tide will turn and there will be an attack on that added identity. But for now we are at the height of it. Latino music in the United States, it goes without saying, is the field in which this agglomeration is most clearly felt. Every group of immigrants in the country finds its favorite form of expression, which even if not exclusive, becomes a dimension with unique properties: for the Jews it was literature and film, for the Africans dance and music and for the Irish politics, etc. In the case of Hispanics this "social oil" is music and Spanglish is its expression. TBR: Can you elaborate on the impact Spanglish has on music, especially the currently popular hip-hop, now at its peak? Spanish language rap, which often uses Spanglish, has entered the Latino market in the United States. Does this mean that Spanglish is on the way to being accepted by the majority, even the upper classes? IS: Its influence is liberating. Today Spanglish gives the impression of being ubiquitous in Latino music. But this is a superficial impression. There have been traces of it since the era of the revolutionary ballads of Pancho Villa and Emiliano Zapata, not to mention the popularity of the urban beats like the mambo, the rumba, the cha-cha-cha, and others from rural origins, like the rancheras (Mexican folk songs). I should add that it also left its mark on Latin American music. Today, there are a significant number of singers and groups that use it. Think, for example, about Café Tacuba from Mexico or Juan Luis Guerra from the Dominican Republic. Or groups like Orishas and Quetzal. However, its influence on Hispanic musical production north of the Río Grande is, indeed, unquestionable. Is that a sign of acceptance by the status quo? Im convinced that it is. There are African American rappers who often use it because they know that by using Spanglish theyll reach a wider audience, or at least it will be seen as cool by their own people. Thats how bands like Cypress Hill employ it, sometimes without knowing what kind of vocabulary theyre using. In his lucid, philosophical 1961 book, La invención de América, Edmundo OGorman talks about Christopher Columbus´ discovery of the American continent. OGormans opinion is that the Genoan sailor, even if he didnt know about the existence of the other side of the Atlantic, suspected it subconsciously. In order to prove his thesis he provides the following paradigm: a pedestrian walking along the sidewalk suddenly trips over a little gold stone; his first reaction is to pick it up. Why? The answer is easy: he knows that gold has a social value and he does not want to miss the opportunity to reap its benefits. If he were from a historical period in which gold didnt have value, would he bend over anyway? Obviously not. Something similar is going on with Spanglish. Its existence is not new but weve only become aware of it over the last few years. By doing so, we begin to understand that, like gold, it was present in earlier eras, but few people paid attention to it. However, in the present day it has become an artifact of value and ignoring its possibilities is a kind of blindness. TBR: In your book Spanglish: The Making of a New American Language (HarperCollins, 2003) you say that Spanglish is not just a language of the uneducated. What is it then and how do you think Spanglish symbolizes the current situation of Latinos in the United States? IS: Indeed, it is widely perceived as la jerga loca, the tongue of those without access to power. But Spanglish is far more sophisticated and savvy than that suggestion makes us believe. It has been around for at least one hundred and fifty years, since the Treaty of Guadalupe Hidalgo was signed in 1848, in which two-thirds of Mexicos territory was sold to the United States for $15,000,000. Even if those territories were scarcely populated, the number of dwellers in what is today the Southwest is estimated at around 80,000 people needing to adapt to their new reality. Adaptation, of course, meant change: political, religious, culinary, sexual, and of course verbal. Today Spanglish is used by the indocumentados, but also members of the middle, upper-middle, and upper classes. Still, it is looked down on by intellectuals as illegitimate and perhaps even as a form of deformation. How does it symbolize the situation of Latinos of all backgrounds? As a many-petal flower. Latinos are a complex minority not easy to categorize. They are multi-racial, transnational, and plurilingual, and they share contrasting political views, are affiliated to a whole gamut of institutionalized religions, etc. Spanglish, in fact, often serves as a bridge to unite them. TBR: In comparison to the highly-polemical African-American Ebonics, what will the next step be for Spanglish? IS: Black English, as Ebonics is commonly known, displays similarities with Spanglish, but it also has important differences. Black English is the product of generations of speakers, and thus, has a clearly defined syntactical structure. In spite of the randomness with which the media often portrays it, Black English has a more or less established lexicographic bank from which users regularly draw. As a vehicle of communication, it is embraced, predominantly, by a younger generation in the inner city, although it is also used by mature adults. Spanglish is also used by the young, but not exclusively, and it isnt limited to ghetto life. Migrant labor employs it regularly, despite age and geography. As a result of the demographic explosion, Latinos and non-Latinos of all ages and classes use it. One is able to hear it on the street, in the classroom, on TV and the radio, and one reads it in newspapers such as La Opinión in Los Angeles, El Nuevo Herald in Miami and El Diario/La Prensa in New York. The United States is an open society in which immigrants play a crucial role. That role includes the constant renewal of the national language. Spanglish has been an important force in that renewal for a while, although only now it is receiving the attention it deserves. Needless to say, the criticism labeled at Black English that it is an obstacle for Blacks in the journey toward assimilation is also targeted toward Spanglish. Some suggest that Spanglish is a middle step in the process of language acquisition, whereas others believe it is a trap for those looking to climb the economic hierarchy. My own view is different. I dont know how Spanglish will end up in the future, but I do know it plays an important role in the present. Instead of seeing it as a middle step or as a trap, I believe it is the symptom of an altogether new mestizo civilization being born in front of us, one that is part Anglo and part Hispanic, although neither here nor there. TBR: In this intermediary zone, between the Anglo and the Latino, we come again to the hip-hop bands in todays rock scene, bands like Latin Alianza, Chicano 2 Da Bone, Latin Lingo, Dr. Locos Rockin Jalapeño Band, Ganga Spanglish, KMX Assault. As one of your students says in Spanglish, these groups "are only reflecting whats happening en la calle. . .They arent inventing it! Yeah, they are artists. But people wouldnt like their music if their songs didnt touch a cord. It aint matter if youre puertorriqueña or mexicana. You listen to it because its hip. Hip and hot." IS: It would be absurd to minimize the role played on a national level by figures like Rubén Blades, Willie Colón, Mongo Santamaría, Paquito DRivera, Gloria Estefan and others. They are the center of attention and their art introduces a considerable portion of the population to the Hispanic scene. In this sense Spanglish has benefited incredibly from groups of rock, hip-hop, salsa, bachata, merenegue and corridos (ballads). Among them the inevitable juxtaposition of codes and the use of improvised grammatical rules are normal. Of course, I should stress that this use isn´t recent. Spanglish in Latino music goes back decades. It was already in use when the rumba and cha-cha-cha were popular beats in New York. TBR: What authors would you highlight on the literary scene and how do you think these authors represent that Anglo-Hispanic reality? IS: The current Latino literary scene is intriguing. Sandra Cisneross novel Caramelo uses a peculiar form of English, which I would described as "transferred Spanish," for the narrative appears to be thought out in one language but delivered in another. Junot Díaz used Spanglish symbiotically in Drawn. Along with them there is an army of authors eager to experiment. It ranges from more verbally liberal ones like Susana Chávez Silverman, author of a personal memoir in Spanglish, to more conservative enablers, like Oscar Hijuelos, whose use of Spanglish is marginal. Fortunately, we´re in a period of cultural expansion in general and literary expansion in particular. There is a new generation of writers born in the 70s who are taking their first steps. For them Spanglish is not something to be embarrassed about. TBR: Your book Spanglish contains your Spanglish translation of the first chapter of Don Quijote de La Mancha, which has been quite controversial. Are you considering translating the whole novel? IS: Maybe in the future. Right now I have pressing commitments that push me in other directions. One of my next projects is a meditation on the dictionaries of the world. When and where did they first appear? I have a personal collection of almost a hundred and I have a lot of fun scrutinizing them. Id like to write about the obstacles the reader comes across in them as well as the poetry contained within their pages. TBR: Would you like to see a Real Academia del Spanglish formed at some point? IS: No, I hope not to. There is nothing more counter productive than a governmental institution in charge of legislating a language. Language is the most open and democratic manifestation of the spirit. TBR: You also state that the principal attacks against Spanglish come from Spain because the country harbors an ancestral grudge against Anglo-Saxon culture, rooted in the defeat of the Spanish Armada and the war against the United States, which meant the loss of Cuba and Puerto Rico. You also brand the Real Academia de la Lengua as a retrograde institution at the service of a re-conquest of the world through Spanish. IS: Spain has given a lot to the Castilian world but at the expense of eclipsing other languages of the Peninsula. Today the issue of the autonomous regions is intimately linked to that eclipse. For example, the full title of the Sebastián de Covarrubias´ canonic book, published in 1611, which scholars used as their basis in compiling the Diccionario de Autoridades and which is also the foundation of the Real Academias Diccionario de la lengua española that we use daily, is Tesoro de la Lengua Castellana o Española. It isnt hard to figure out why he used "Castilian or Spanish": our language travels historically from Castile to the entire country and from the Iberian Peninsula to the colonies. What happened to the other verbal expressions of the Peninsula? They were devoured by nationalist zeal. But first with the "invincible" Spanish Armada and then especially from 1898 on that nationalist zeal came up against another, equally reckless nationalism: the nationalism of the English speakers of England and subsequently from the United States. Its true that in Spain the wound of this defeat has yet to heal. The loss of satellite colonies like Puerto Rico and the Philippines, not to mention the territorial extension we know today as Hispano America, still smarts. Among other things, Spanglish is controversial for this very reason: it reminds the Spanish that their colonial legacy is a legacy of political defeat and cultural adulteration. With regard to the Real Academia Española, it is not a totally modern institution. Its linguistic enterprise is still limited to this antiquated motto that conjugates its verbs in the imperative: "Clean, fix and polish." It is no accident that the conjugation should have that name: "imperative," derived from "empire." TBR: You´ve written short stories in English and Spanish. One of them, "Xerox Man," has been frequently anthologized and appears in The Essential Ilan Stavans (Routledge, 2000). Is there a novel on the horizon? IS: I have one in mind with a translator as the main character. Sometimes I wake up in the middle of the night after a dream in which this protagonist appears to me. The time will come when, to calm him down, Ill have to let him emerge in a more systematic, organized way. TBR: What Spanglish words do you especially like for their imaginativeness, creativity and spontaneity? IS: I like the word "colid," which comes from caller ID, the personal identification code needed to make a phone call. The term "for-yun-key" refers to the name used in the accounting department for a 401(k) account. "Kennedito" means traitor and comes from John F. Kennedy. The "carolas navideñas" I also like as a name; it comes from Christmas carols. Or the word "grincar," synthesis of green card, the immigration permit given by the federal government. The expression "no janguear", difficult to translate, is one of my favorites; it means something like "No wandering" or "No improvising." I like it precisely because it goes against the very essence of Spanglish.